When my skilled and knowledgable travel partner and I left the Puget Sound, the big news story was “Viiadoom.” The highway 99 viaduct in downtown Seattle is being removed. Today’s Seattle Times reports that the Seattle City Council approved $160 million tax on downtown property owners for a new waterfront park. I have also seen waterfront renewal in San Francisco, Vancouver, Canada, and my old hang out Eureka, California. While visiting Kaohsiung in Taiwan, I saw another waterfront urban renewal project in progress. A hazy, bad air day in Kaohsiung, Taiwan. One of their top attractions listed for Kaohsiung is the art district Pier 2. Kaohsiung is looking to change its waterfront areas from areas of industry to areas of people, culture, and art. When we first arrived at the waterfront, it was mid-morning, and we had the place to ourselves. There are large murals on the sides of the buildings, small art incorporating pipes and building support structures, and there was free standing art along the central walkway. It is a nice place to stroll and take selfies, which is a common activity in Taiwan. 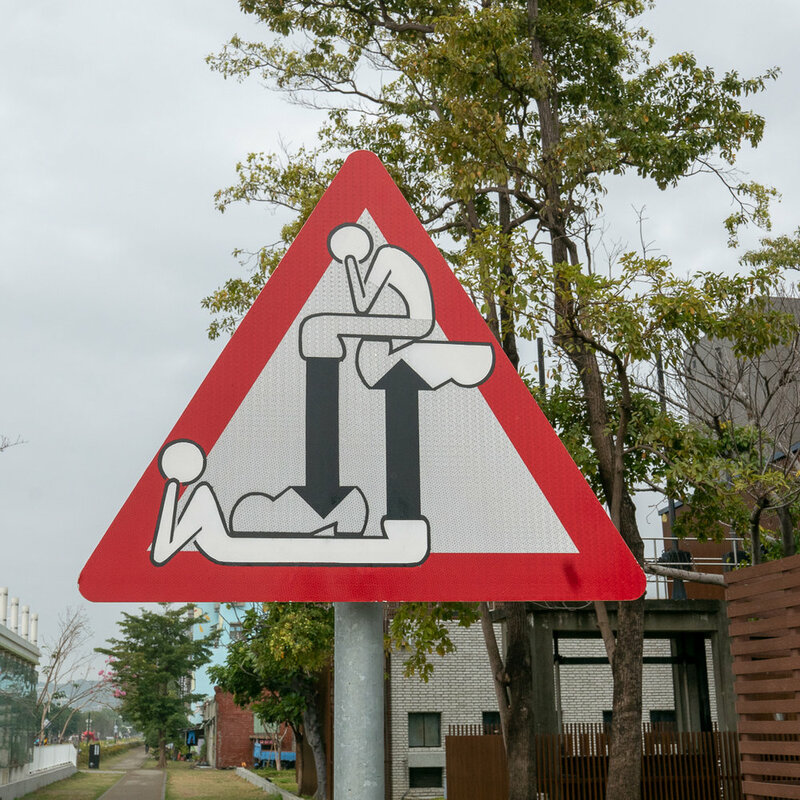 I like to collect photos of street art to use as a screensaver on my television back home. I found a lot to photograph. Many of the old waterfront warehouses were now housing local art, jewelry, and assemblage artworks. I can imagine that there are nighttime events that really get the streets rocking. 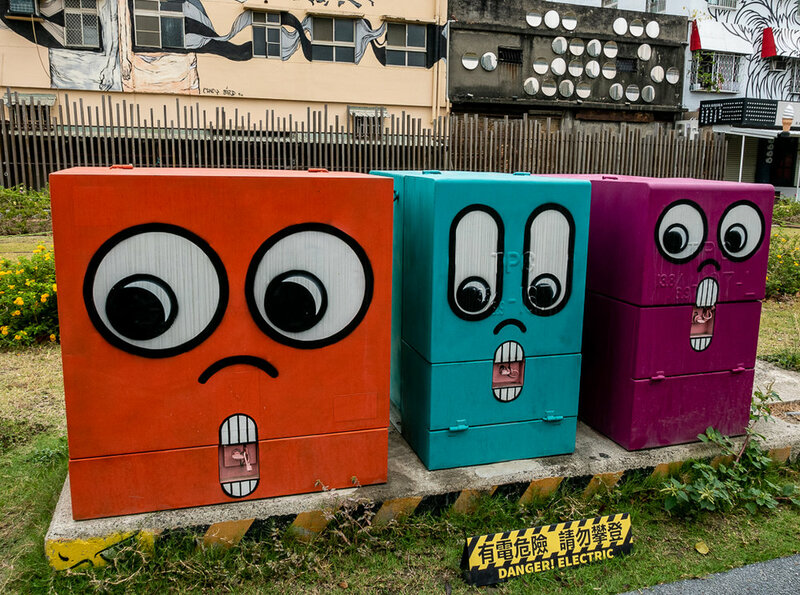 The area isn’t 100 percent occupied, and there is a lot of room for growth, but Kaohsiung is apparently trying to make a friendly and safe place for artists to display new works and a safe place for families. There were many school groups touring Pier 2. On one end is new construction, on the other end is a small railway museum and the light rail that wraps around the waterfront and connects with shopping, stadiums, residential areas, and other train systems. The Chinese Zodiac are surfing dudes. 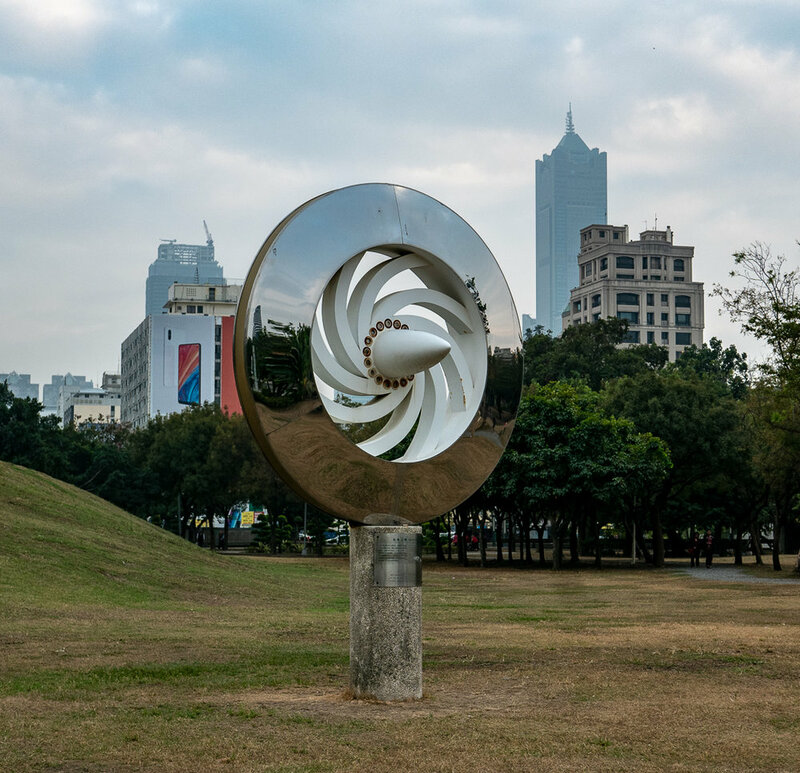 When you enter the Kaohsiung Central Park, you can tell that they link art with cultural, economic and social progress. As I check out the artwork pieces, including the beautifully designed and re-constructed metro station, I see a lot of effort. There are new pieces and several works that look like they have been sitting there for a while with little or no maintenance. The park demonstrates that it is one thing to make new installations, it is another thing to keep them up to date and looking fresh. “The Eye of the Future” I found the statement more interesting than the work of art. It is good to have goals, and I can see that they are still working on reaching their dreams for the future. 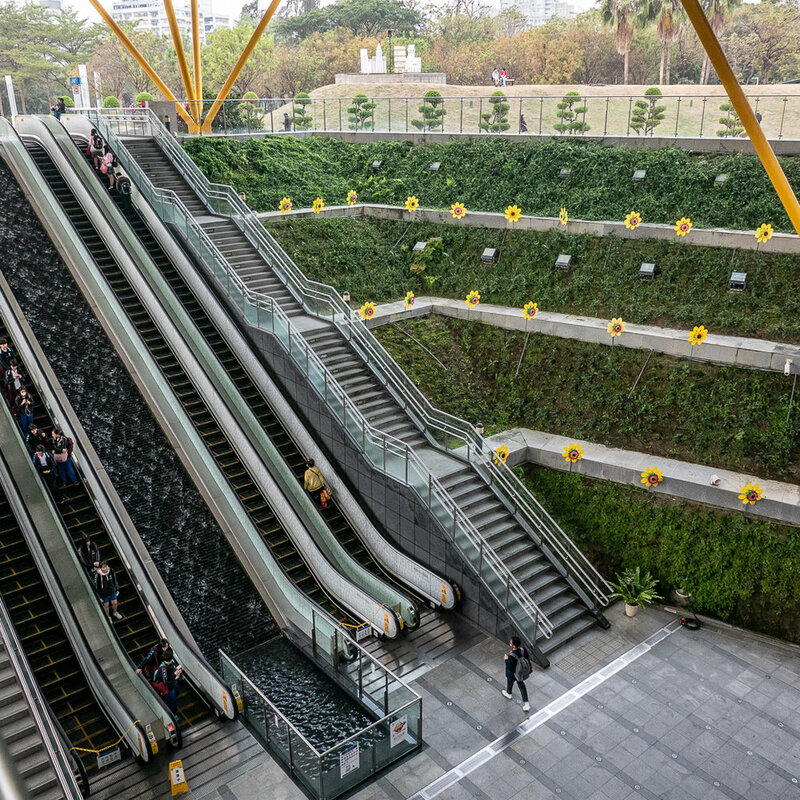 The impressive Central Park Metro Station, with large daisy pinwheels in a vertical garden. 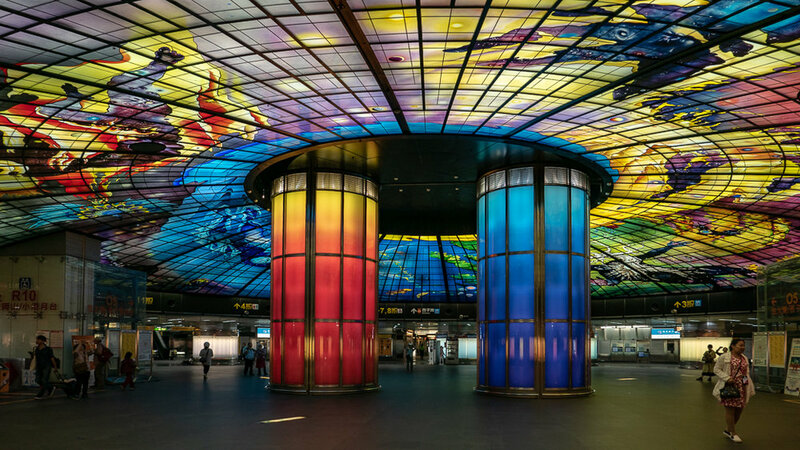 The Dome of Light is within the Formosa Boulevard metro station in Kaohsiung. This works boasts that it is “The largest glass work in the world.” When we visited this station someone was playing the piano, and most people weren’t bustling onto the next train, but instead they too were enjoying the art. Birth, life, death, re-birth, space, oceans, trees, wow, - all towering overhead in vivid colors. The Dome of Life is an impressive 30 meters in diameter with 4,500 glass panels. I like big art. This piece is big, bright, and beautiful. 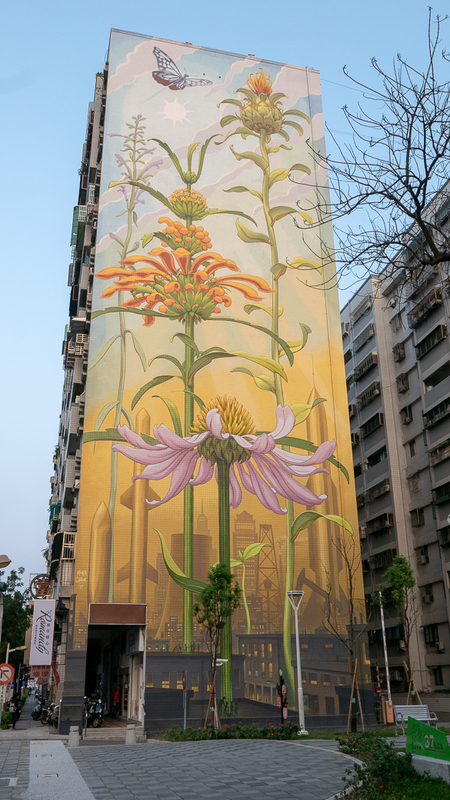 The Outgrowing mural by Mona Caron was featured by Wallriors Festival, and it was commissioned by City of Kaohsiung, Lingya District. It is a “WOW look at that!” when you first see it. The 2017 mural stands tall as an inspiring work of art. We looked this one up on the internet and set out to find it. On a busy street with retail shops and residences, her expressions of hope and optimism stand tall. It is beautiful, and there is not a speck of graffiti or vandalism in the area. I hope the people love this piece as much as I do. It was amazing and my favorite wall mural. Seattle learned that urban renewal takes a lot more than art. 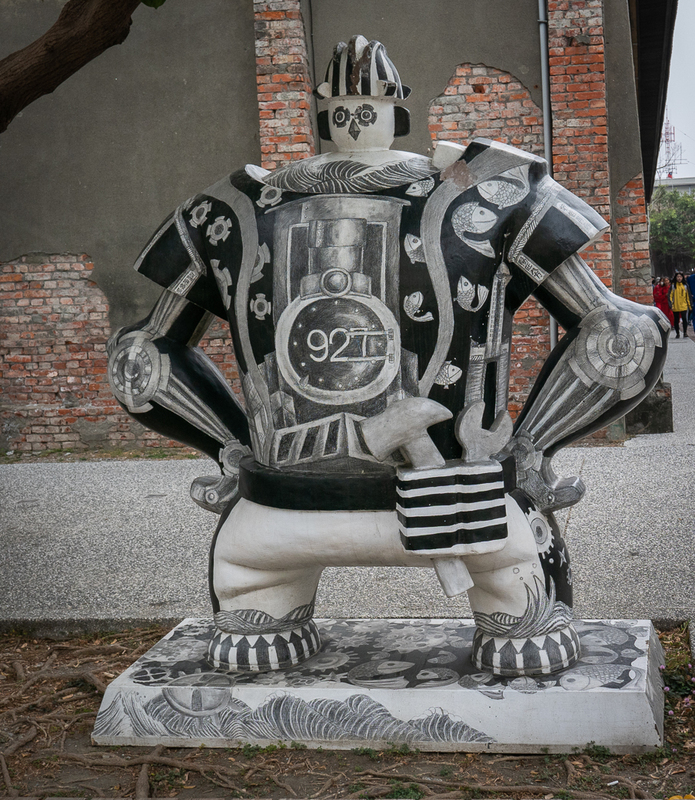 Kaohsiung knows that supporting public art is a good starting place. People will learn about the city, they visit art, hang out, and they will have expectations for future respect and development of the town. Kaohsiung has started the process of change, but they will need more than artists to revitalize the waterfront and the downtown. I like their art, and I wish them the best of progress.